You probably see terms like "megabyte" and "gigabyte" used pretty often. They show up in everything from the amount of storage your phone has to your monthly data plan and more. But how exactly do computers arrive as these figures? Let's take a look at how computers count numbers, the most common amounts of storage, and roughly what they equate to. Normally, we count in the decimal system. This means that each place in a number has 10 possible digits. When you add 1 to 9, the number becomes 10. In binary, which is what computers use, there are only two possible digits per place: 0 and 1. Thus, a value of 1 in binary is also 1, but 2 is "10" in binary. A single place in a binary number is called a bit. This is the smallest amount of information that a computer can record. Eight bits together are known as a byte. From there, binary numbers simply use the standard metric prefixes as the sizes increase. 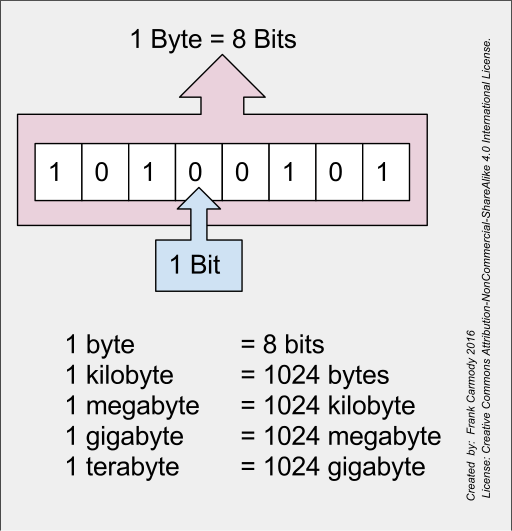 A kilobyte is a thousand bytes, a megabyte is one million bytes, and so on. However, there's a quirk when you represent binary numbers in decimal. In the decimal system, the digits from right to left increase by powers of ten. Thus, it moves from the one's place to the ten's place to the hundred's place, and so on. In the binary system, this increases by powers of two instead. So the first digit is the one's place, then the digit on its left is the two's place, followed by the four's place, and it continues down the line. A kilobyte, for example, is 2^10 bytes, which equals 1,024. This is slightly larger than 1,000, but for convenience, we usually say that a kilobyte is 1,000 bytes. This is part of the reason why when you buy a phone, hard drive, or other storage device, it never has as much space as was advertised. A 128GB device, for instance, will work out to a little over 119GB of actual space. This isn't a huge deal, but it is noticeable. How Big Are Megabytes, Gigabytes, and More? Now that you know how sizes are computed, about how much do each of these measurements take up? Here are some approximate examples. A byte can hold a single character, so every word on this page is composed of multiple bytes. A kilobyte is one thousand bytes. In perspective, one kilobyte equals a few paragraphs. Thus, a small text file on your computer would likely be measured in kilobytes. Moving up, a megabyte is a thousand kilobytes, or one million bytes. One megabyte could hold a short novel. Additionally, the average MP3 song file is roughly 1MB per minute. A standard CD holds around 700MB. A gigabyte, or one thousand megabytes, can hold about 300 MP3 songs or seven minutes of HD video. A standard DVD holds a little less than 5GB. Meanwhile, Blu-ray discs typically have 50GB of space. Getting into large storage amounts, a terabyte is 1,000 gigabytes. This would hold about 130,000 average-sized photos, which would equate to taking 400 photos every day in a year. 10TB could hold the entire printed contents of the Library of Congress. A petabyte is probably the first size on this list you haven't heard of before. It's equal to 1,000 terabytes, which is a staggering amount of information. 1PB could hold 500 billion pages of printed text, and Google processes something around 20PB of data every day. Beyond this are larger denominations, but as they're so huge they're not ones you're likely to come across anytime soon. An exabyte is 1,000 petabytes. Put in perspective, 5 exabytes could hold every word ever spoken by humans. A zettabyte equals a thousand exabytes, while a yottabyte is 1,000 zettabytes. 1YB could hold the entire World Wide Web, which is staggering to think about. We've taken a look at how computers store information, some common denominations, and what they could roughly store. You don't need to be too concerned with the smaller and larger numbers. It's unlikely you'll deal with binary bytes directly, and probably nobody alive today will see a yottabyte of data as a normal measurement! As time goes on, the quality of media files like photos and videos increases due to better camera hardware. Software also becomes larger due to HD graphics and more features included. The storage capacity of hard drives, phones, and other devices increases to match this. Consider that the original iPhone, released in 2007, was available with 4, 8, or 16GB of storage. The iPhone XS, released 11 years later, starts at 64GB and goes all the way up to 512GB. It's anybody's guess how much storage our phones will have in another 10 years.